Figure 1. #00 km long scarp on Mercury, due to recent rapid shrinking of the crust . Once again NASA engineers have performed a near-perfect mission and once again the scientists have completely mis-interpreted the priceless data they collected. Hopefully, the data from all the missions is stored safely until that day when a truer understanding of the solar system prevails. 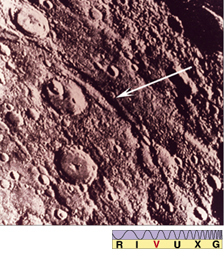 One of the most unique features in the NASA Messenger images are numerous long, high scarps which extend for hundreds of kilometers, one of which is shown in the figure at the right, below. These are correctly interpreted as evidence of shrinkage of the planet, unlike any other in the solar system. Unfortunately, the Messenger scientists go beyond the data and add that the scarps preserve a record of fault activity from early in the planet’s history, 4.7 billion years ago. How do they know the age of these formations? They use a completely bogus method which involves counting the number of large craters per unit of surface area derived from craters on the Moon. It is true that these scarps are the result of shrinkage of the planet, there is also a grain of truth in the notion that it occurred ‘early in the planet’s history.’ But the history of Mercury as a planet only extends back to about 687 BC. Prior to that date Mercury was the solid iron core of Mars. When the solid core exited priori-Mars and was deflected into the inner solar system it was very hot and glowing as reported in the myths of ancient cultures. It was Hathor (Egyptian), Hermes (Greek) and Mercury (Roman). In ancient Hebrew it was called the ‘sun star’ because it glowed brightly. Since then it has cooled rapidly and obviously shrunk forming the high scarps, which are therefore less than 2,700 years old not 4.7 billion years. By far the most common surface features are impact craters, but project scientist also claim to have identified evidence of volcanism. I fail to see any such evidence. One possible feature which might be interpreted as volcanic are large impact craters whose interiors appear to conform to the spherical shape of the planet (part of one is also shown in the figure), but these are not volcanic in nature. Rocks and dust, also blasted from the earlier, complete form of Mars during the Bronze and Iron ages, when it orbited the Earth, have subsequently landed on Mercury’s surface. This regolith is the same stuff that forms the regolith on the Moon. Then larger bodies, also blasted into space from the same planet, hit Mercury they formed impact craters in the regolith. But because Mercury is solid nickel-iron (see below) the impacting bodies cannot even make a dent in it, thus the bottoms of the craters are just the pristine surface of the former solid core showing through the regolith. Large impact craters on Venus seem similar, but formed completely differently. Since Venus is a new planet with a roiling interior of magma beneath a tenuous crust. Large impacts can easily punch through the crust, but the magma just below the crust immediately flows up into the hole in the crust and naturally takes the form of the planet dictated by gravity – essentially its ‘sea level’. The bulk density of Mercury leads scientists to believe there is a thicker layer of non-iron on its surface, but calculations of the density of the solid core of the Earth also produce a density below that of pure iron or nickel-iron. The usual explanation of the lowered density is that sulfur might be mixed with the iron, but the density of sulfur is quite high and it take a lot of it to reduce the density appreciably. Based on super-high pressure laboratory experiments with iron in a diamond anvil, it was found (accidently, when a seal broke) that hydrogen moved quickly into the entire iron lattice forming a layered crystalline form of FeH. The researchers studying the structure noted that this layered form resembled that of certain known superconductors. Based on this, I suggest that the internal dipole magnetic fields of planets are generated by super- currents in the hot, high pressure, solid FeH core and not by the currently accepted hypothesis called the ‘dynamo effect,’ supposedly due to the ponderously slow swirling of the liquid core between the solid core and the mantle. Due to the reduction of the pressure on Mercury formerly provided by the overburden of the liquid core and mantle, it is not now possible to maintain the FeH superconducting structure near the surface, and it only exists deep inside Mercury. This is the reason that its magnetic field is much weaker than that of the Earth, today. Establishment scientist’s current enchantment with the dynamo effect leads them to believe that Mercury ‘must have’ a liquid layer in its interior. If the magnetic field of Mercury is found to be a perfect dipole, then the dynamo effect will be proven incorrect. Also, measurements of Mercury’s wobble will indicate whether Mercury is a solid iron sphere. ~ by Angiras on February 2, 2008.